As some of you will by now be aware I started working at Orwell Trucks Mercedes Benz at the beginning of July. 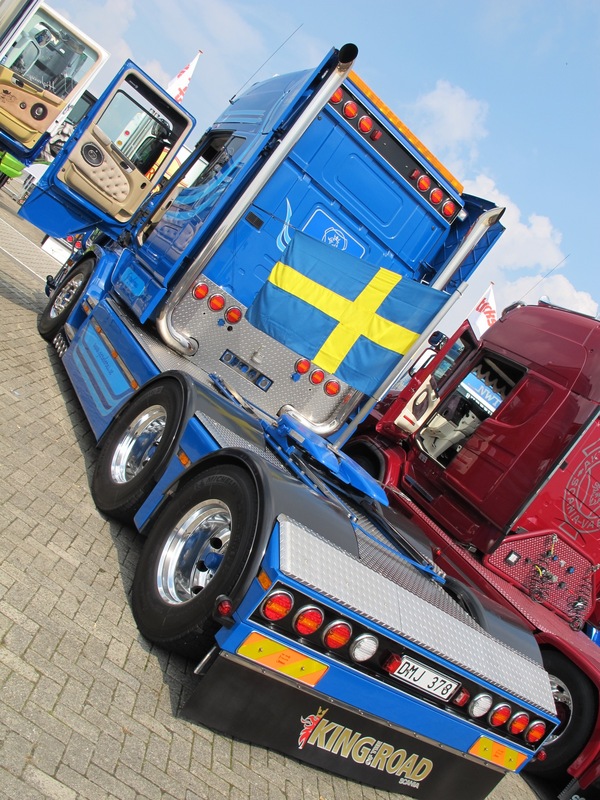 Having always worked in transport and l haulage a move into trucks sales seems to have been a good move. When you start at any new workplace it seems there is always a “Martyn Beverly” character some where in the company. Mr Beverly is a quiet man who has learnt his trade from the ground up, he still earns his keep by supplying all the large fleets of East Anglian and beyond with the Mercedes Benz commercial vehicles. 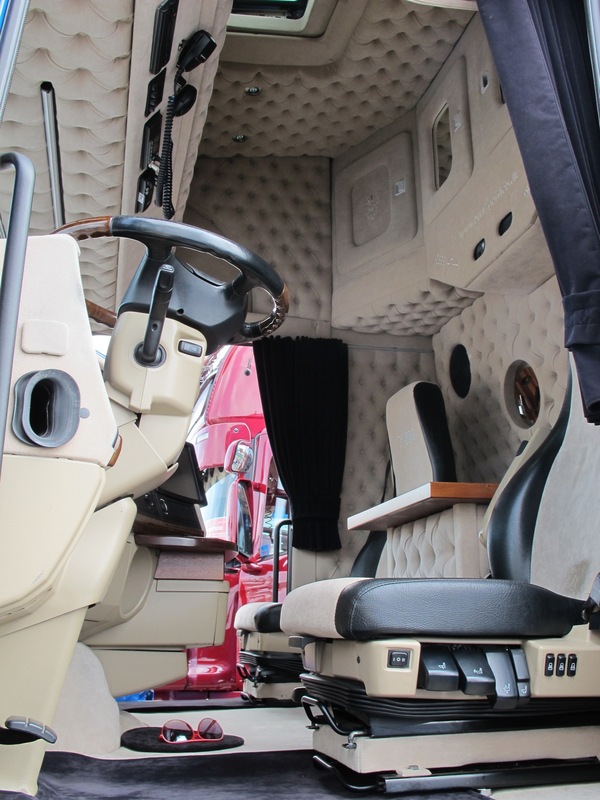 The wealth of knowledge Martyn has for MB trucks and vans having worked for Orwell Trucks for over 30 years is amazing. A couple of days sat with Martyn can teach you more than reading any brochure or book or even going on an MB training course. 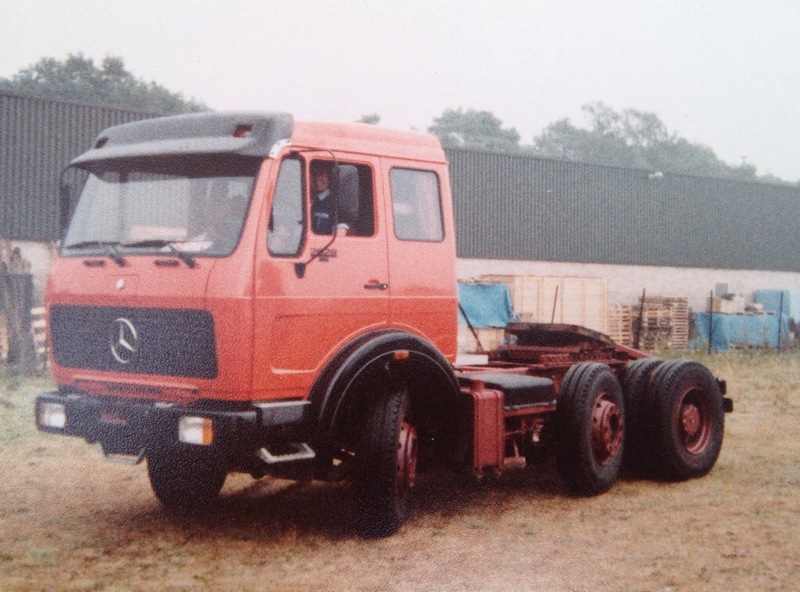 As we clearly have a shared interest in trucks I was keen to let Martyn see some of David Scarff’s MB truck photos, especially ones of local trucks. The above photo was taken by David Scarff outside Fred Archers yard one Saturday morning in the Mid 1980’s. 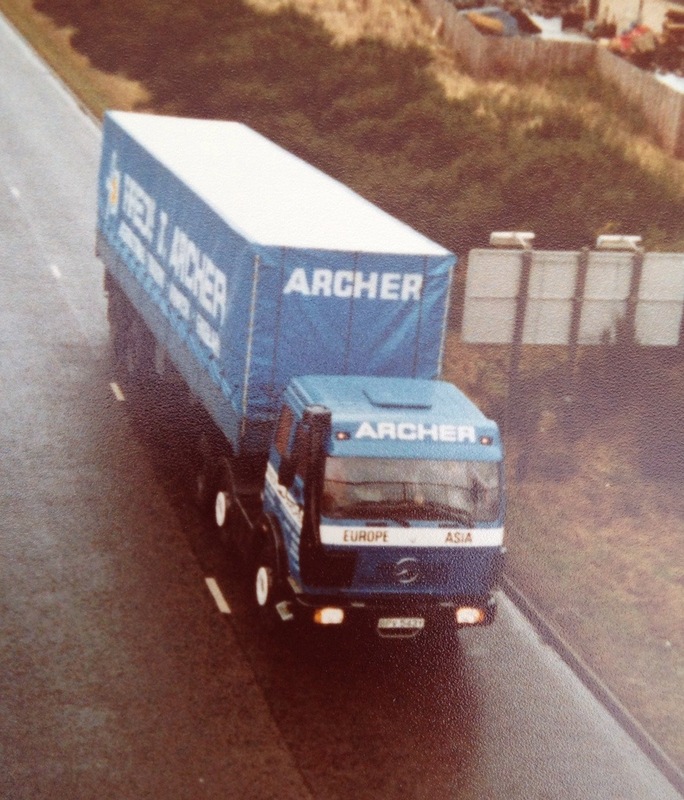 As soon as Martyn saw this photo he said he sold the truck to Archers. Cue the flood gates for plenty more info and all I could want to know about the story of this particular truck. I asked Martyn to write down what he could remember so below is just that……. 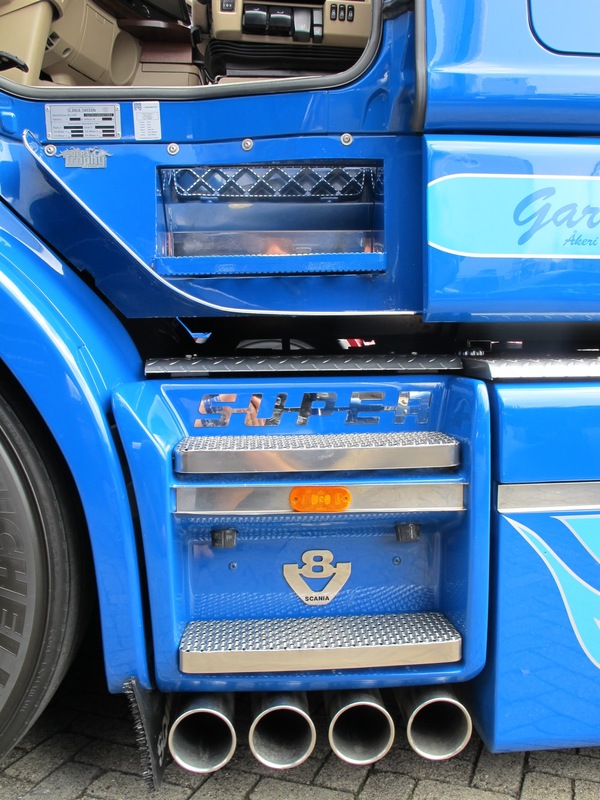 With the impending introduction of 38 tonne GCW artics on 5 axles in 1983, operators with fleets of tandem axle trailers and 2 axle units, need a 3 axle tractor unit to comply with the new legislation. 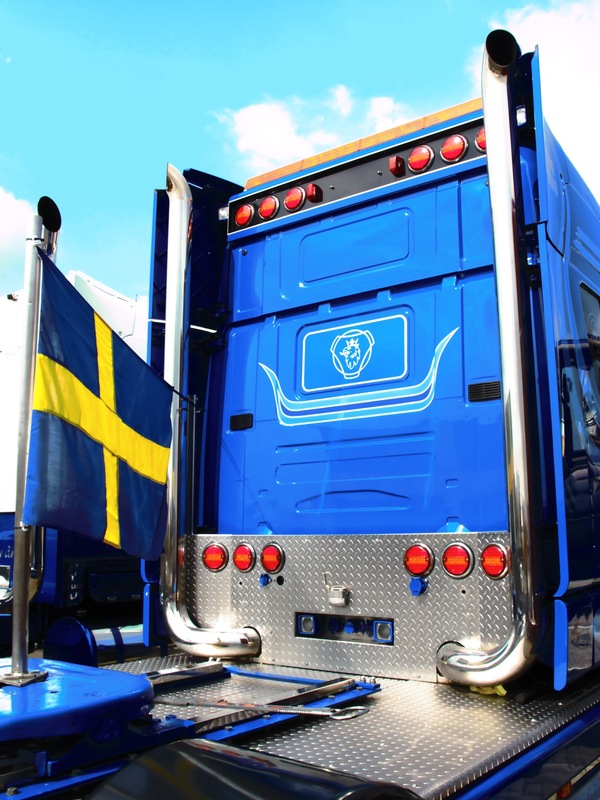 Some truck manufacturers had a problem as they nothing developed to meet this requirement. Luckily Mercedes-Benz already produced a suitable vehicle in Europe which could easily be modified to suit the UK market – Enter the 2028LS. 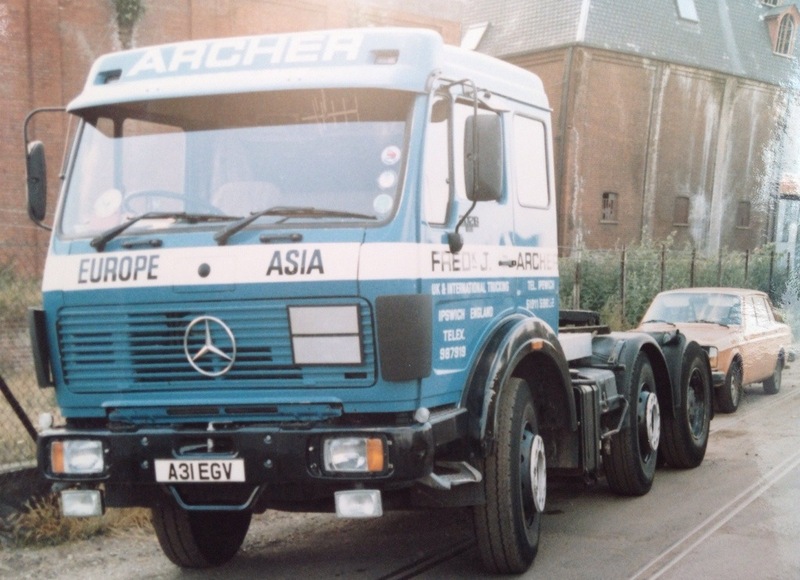 In 1982 Mercedes Benz decided to bring a single vehicle over to the UK to assess its suitability. I saw a picture of it in a Mercedes company brochure under the heading “An intriguing development for the future”. 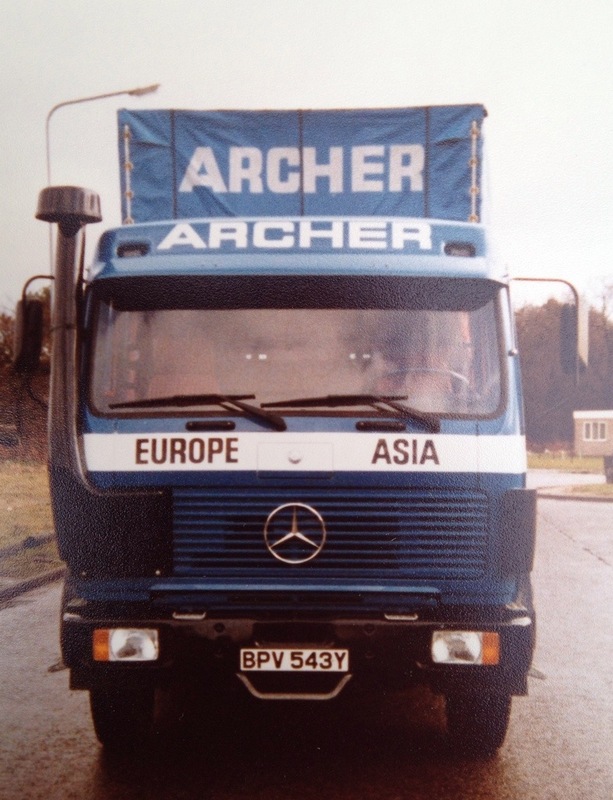 During one of my many meetings with Fred Archer, I told him about this truck and he was very interested as he had seen them whilst on his travels through Eastern Europe. I investigated and found out that this vehicle was at the Mercedes vehicle preparation centre at New Millerdam near Wakefield. I asked asked if I could borrow it and much to my surprise they said yes. Our driver Brian Booth picked the vehicle up and bought it back to Ipswich so we could have a look at the spec as there were no Data Sheets available. – MB 14.6 litre naturally aspirated V8 engine. 276hp. – Fuller roadranger constant mesh 13 speed gearbox. 4 speed + range change + splitter on top 4 gears and a crawler. Very unusual as it would have normally been a ZF Ecosplit. – Centre axle permanently steered with air suspension above a steel spring load transfer device. – 3,750mm outer axle spread – the prop shaft was as thick as a telegraph pole! 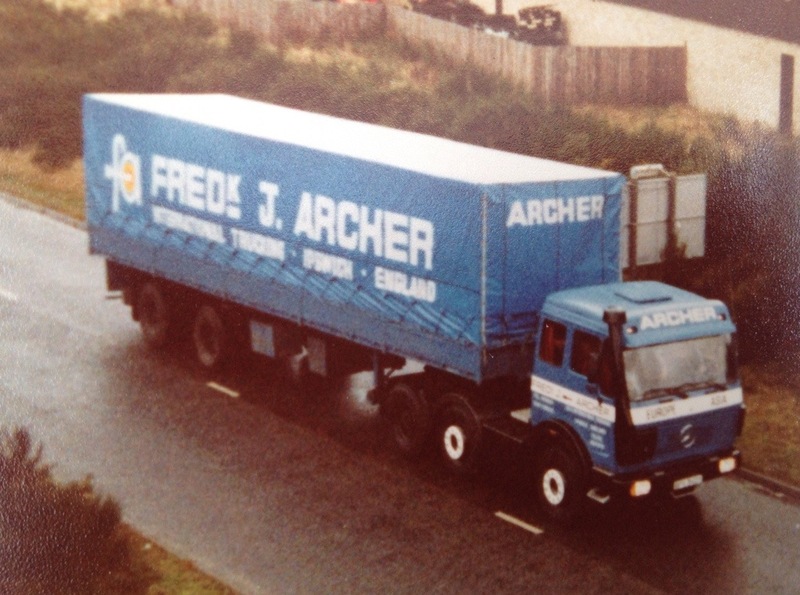 I took the vehicle down to Fred (Archer) and hitched it onto one of his trailers and we went for an extensive road test around Ipswich, after which Fred definitely wanted to buy it – if the price was right of course! I went away and got the numbers sorted and Fred ordered the vehicle. No records exist but I reckon it was around £30,000. 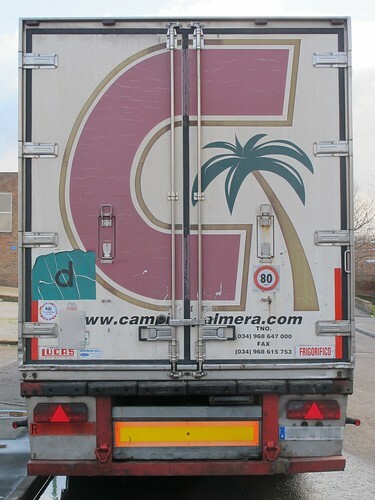 This truck was very unique as it was the first of this model ever to be sold in England. To prepare the vehicle we fitted the snorkel front air intake, a radio, cab heater, rear wings, alloy cat walk / fuel tank (from GB Engineering in Wisbech), sun visor, full chassis and cab paint and finally it was sign written by Rod Chapple using a good old brush and paint. When finished and delivered to Fred we did a photo shoot with one of his trailers all around Martlesham Heath and pictures were taken off the bridge over the A12. 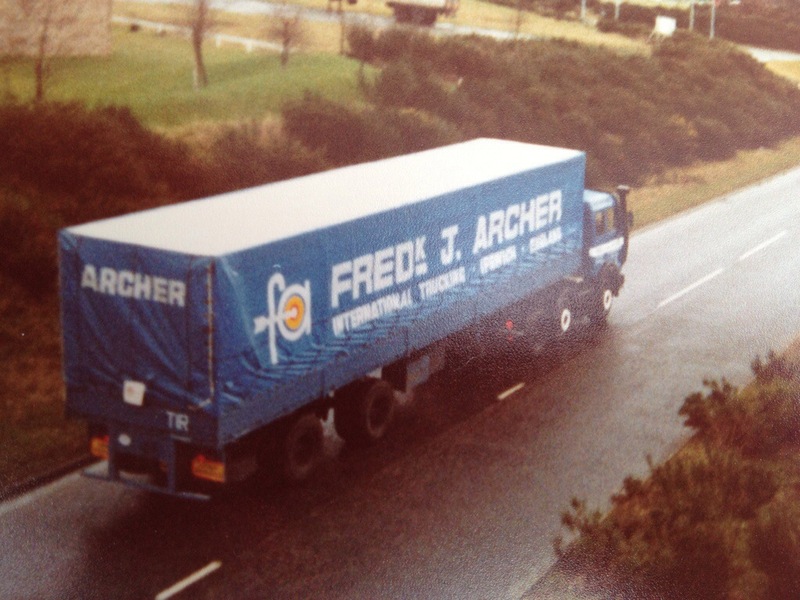 The driver was a chap called Mick Dade who had worked for Fred archer for some time (Mick Dade eventually worked for IST in Harwich as Transport Manager. You can’t ask for a better write up than that all off the back of one photo. The other photos here are all copyright of Martyn Beverly and as ever please respect the copyright. 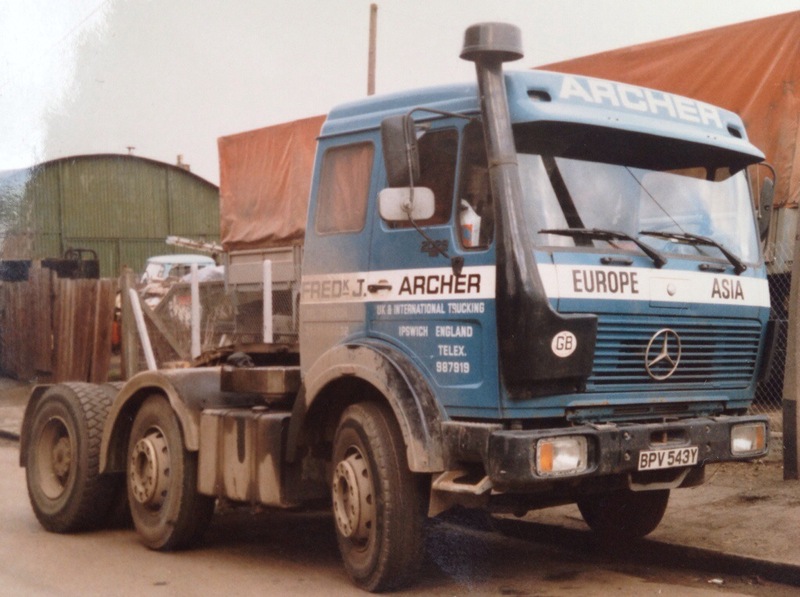 Fred archer must have been impressed with the big German as I found another David Scarff photo of an A reg MB 2028, only visible differences being it’s right hand drive and no snorkel! 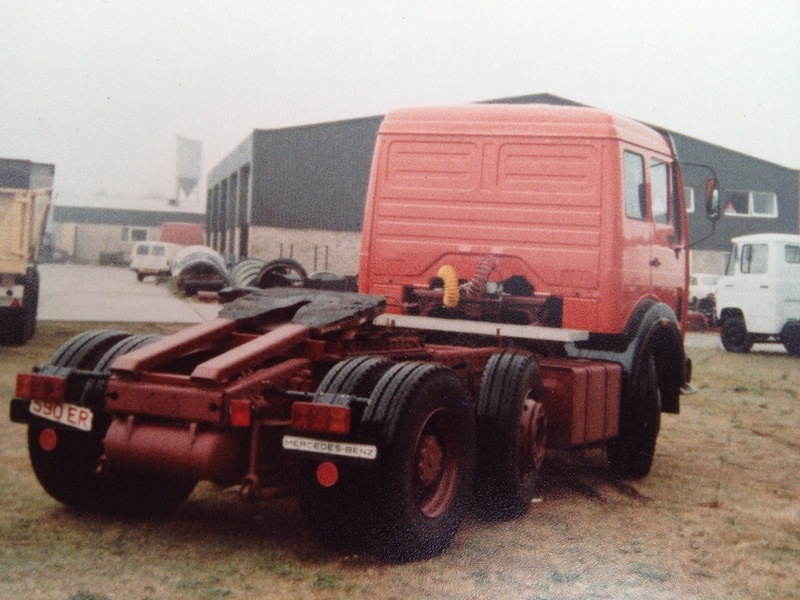 There are a few more old photos in the archives so you never know we might be able to get a few more snippets of the good old days from Martyn and Orwell Trucks back catalogue. 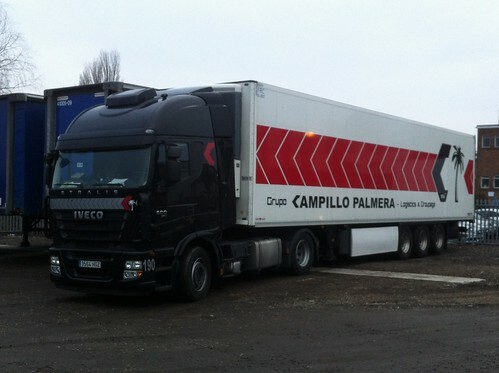 Off you go driver, happy trucking………. You should be aware by now that I am very slowly scanning David Scarffs very large photo collection. Its taking ages but today I finally found the quick scan button for my scanner, so I ploughed through nearly 500 photos in just about 2 hours. As usual I found some absolute belters. Approx 400 photos were Volvo and approx. 100 were Whites. I don’t think I will ever get bored of scanning photos and I don’t think I will ever get bored of an F12 Globetrotter! For David Scarffs Flickr page click HERE. Or if you want easy access to all the different manufacturers sets, then click HERE. The other awesome thing about all these photos taken from the 1970’s and 1980’s is everything that is going on in the background. I have no idea on how many twin wheel Transits and Bedfords I have seen and also just look at the price of a litre of diesel….35.9p!! As some of you know I am slowly scanning many of David Scarffs photos and let me tell you there are 1000’s! 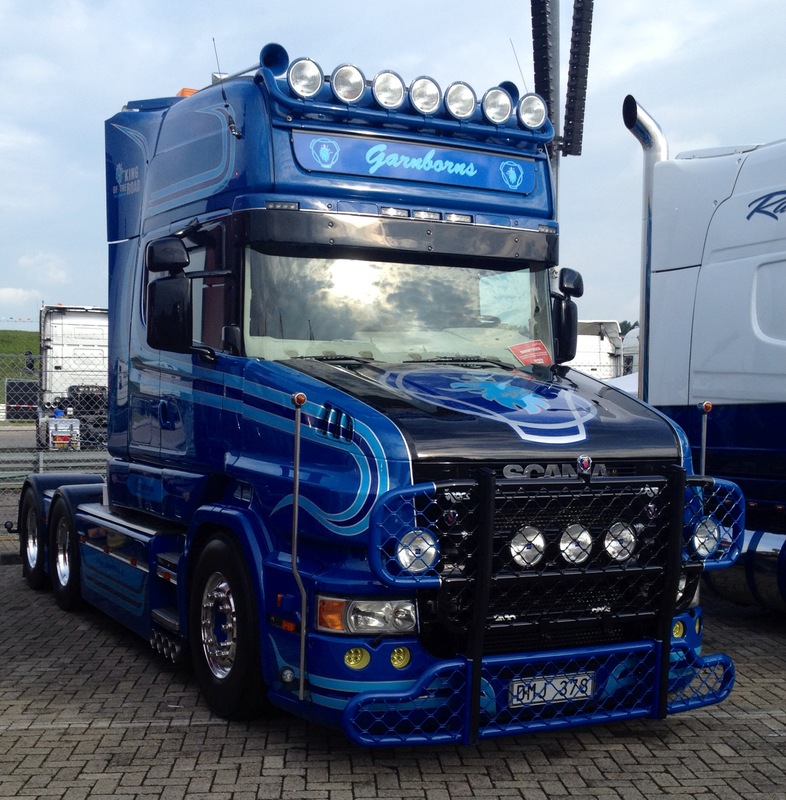 Quickly flicking through the latest batch, this Scania 111 stuck out like a sore thumb. Taken as it was approaching the bottom of Jubilee Way, Dover heading for a boat. What i’d love to know, like many other photos in Scarffies collection, is who’s was it and what happened to such a good old girl. Surely it was an Owner Driver? FOO 146T, a Scania 111, 6×2?, and what a paint job, very smart for its day. A roof rack full of kit and some super smart “Bus” trims on the wheels. 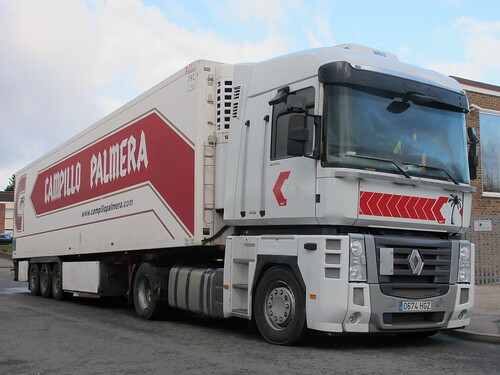 A very clean and tidy frigo box behind, actually you could be forgiven in saying that both truck and trailer look fairly freshly painted. Unfortunately I can’t quite make out the drivers face, so it’s down to your expert knowledge. 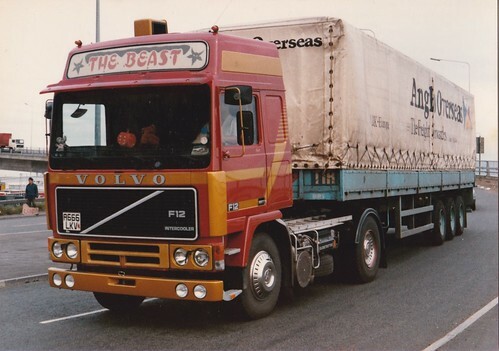 Leave your comments below or send me a quick email: ben@truckblog.co.uk and hopefully we can name who ever was in charge of such a good looking girl. According to the DVLA the truck ran out of tax back in 1990, so another lost to the big scrapyard in the sky. 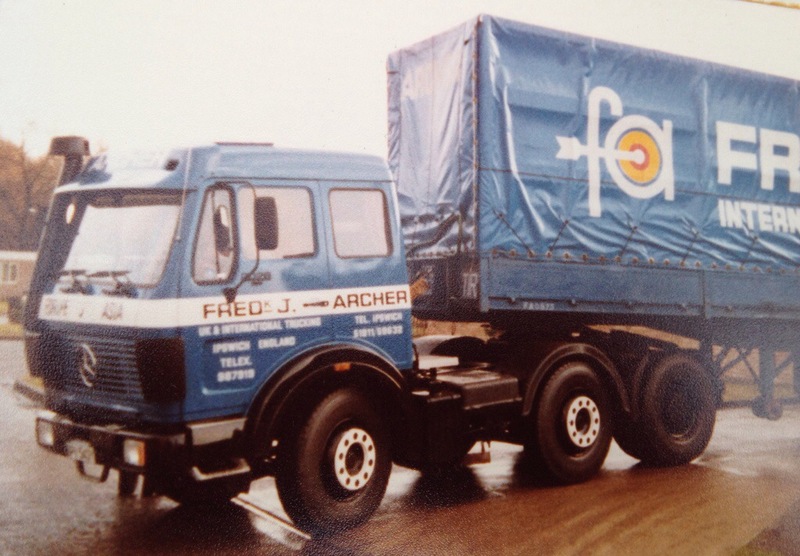 T reg vehicles were launched on the road in 1978 and the reg FOO was originally registerd in Chelmsford, Essex………..Over to you………. 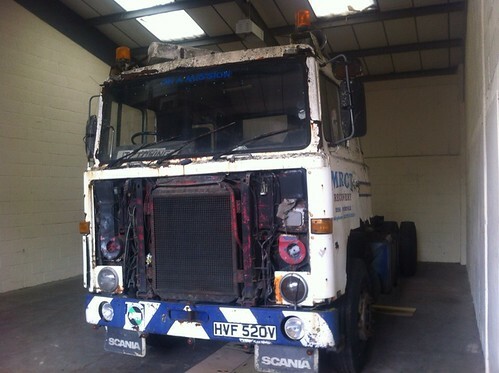 Back in August I reported on a Scania 141 cab I had delivered to Canacraft in Suffolk, if you missed it you can search for it on the blog by typing “Wrecked to Riches” and hitting enter. The idea is that Howard at Canacraft is going to put HVF 520V back to its original spec of a 4×2 tractor unit rather than a 4×2 recovery chassis. I have a fair history for this particular truck, but not through any effort of my own. 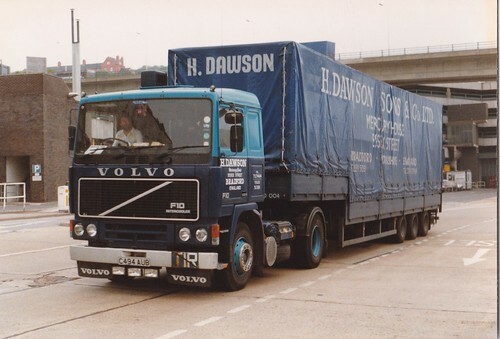 As many of you know I have been lucky enough to be given album after ablum of 70’s and 80’s truck photos taken by David Scarff. 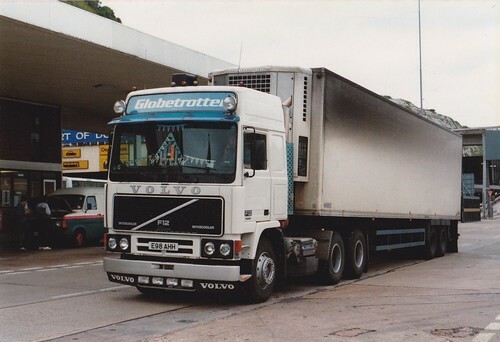 HVF 520V is a truck that has spent a lot of time in and around East Anglia, having had a long career at MRCT (the chicken people!) 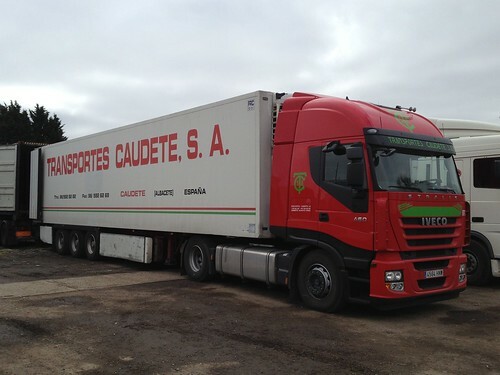 and also a career before MRCT at local haulier DA Garnham. 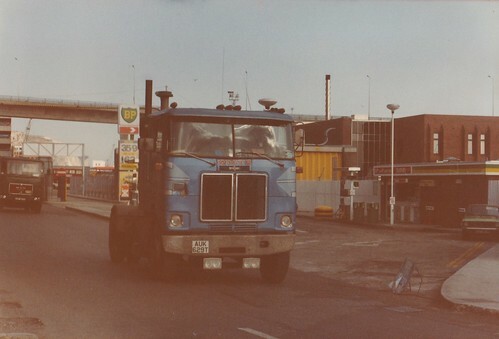 I have managed to find from the thousands of photos in the Scarff collection this right gem of HVF 520V in full MRCT colours at Scania in Stowmarket, I did think there was one of here heading down Jubilee Way into Douvres but its only a 111 not a mighty V8. So good to hear all this info directly from the horses mouth. 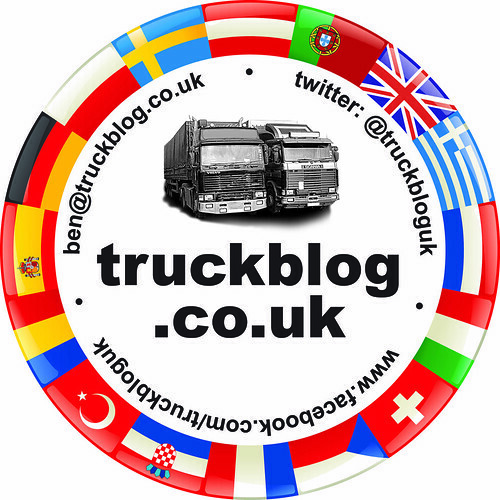 All ex drivers are welcome to email me, ben@truckblog.co.uk , and tell me your stories, knowledge and what ever else. 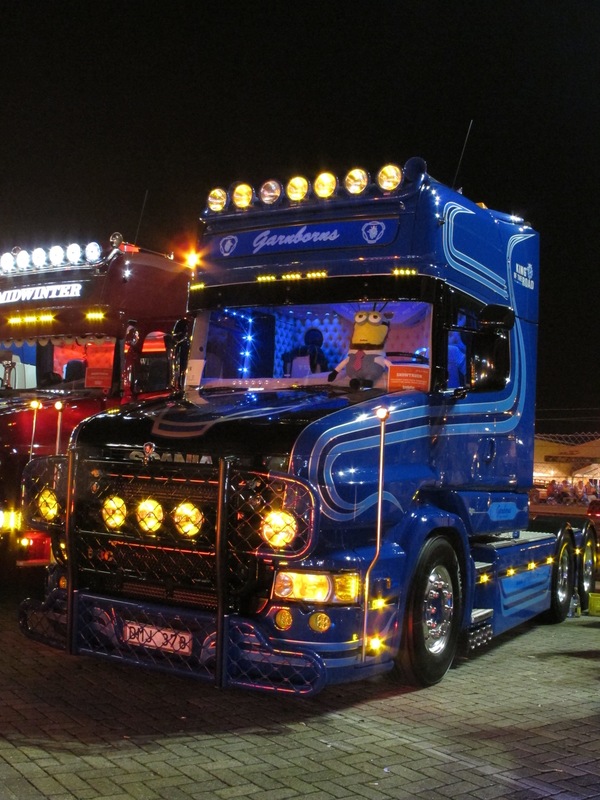 Photos to accompany any info is perfect then at least we can relate to what kinda trucks your talking about. Hopefully I’ll soon have some photos of HVF 520V restored and ready for another owner. 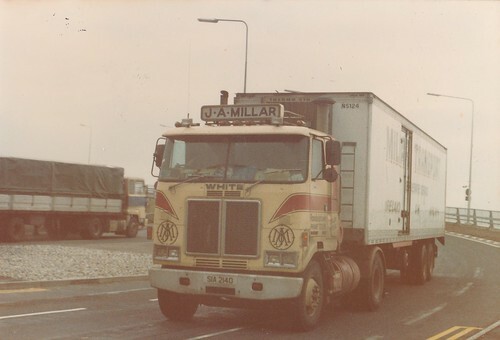 Just to finish off, Mr McClusky mentioned all other MRCT drivers were “slugging around in” Scania 111’s, so to anyone who’s in the slugging gang, I found a photo of sister truck HVF 521V, which was in fact a Scania 111.